Jose Mourinho saw his Manchester United side win back-to-back Premier League games for the first time this season despite Nemanja Matic's late red card. Lukaku's point-blank finish with his midriff opened the scoring in the 35th minute and three minutes later Smalling had the Red Devils roaring. 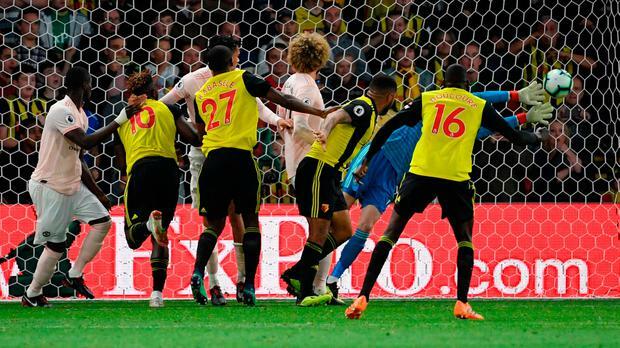 Former United goalkeeper Ben Foster made a string of saves to keep the scoreline down and Watford gave themselves the chance of salvaging a result through Gray's second goal of the season. Mourinho could not call on the suspended Marcus Rashford - a player about whom he launched a lengthy defence during his pre-match press conference. And, while Hornets boss Javi Gracia named an unchanged team for the fifth time, Mourinho opted against playing Luke Shaw - the left-back rested completely after suffering concussion when playing for England. The visitors thought they had taken the lead at the midway point of the first half but Alexis Sanchez was flagged offside as he controlled and finished Matic's cross. This time Young's corner was sent deep into the box, with Marouane Fellaini's knock-down skilfully controlled on the chest by Smalling, with the defender then arrowing the ball past Foster from six yards. Mourinho's men should have been toasting a third goal on the stroke of half-time but Foster again kept Watford in it, throwing his body in front of Pogba's close-range strike. The hosts responded well after the interval and halved the arrears as Gray was left free in the middle of goal to turn home Abdoulaye Doucoure's low cross with 25 minutes remaining. Watford were the livelier of the two sides but were leaving gaps as they chased the game - Foster and Craig Cathcart combining to prevent Sanchez tapping in a breakaway third for United. From the resulting free-kick De Gea had to be at his best to turn away Kabasele's goal-bound header as United held on to claim the points.